When this card is Normal Summoned: You can target 1 Level 2 or lower monster in your GY; Special Summon it in Defense Position, but its effects are negated. If this card is sent from the field to the GY: You can Special Summon 1 “Gadget Token” (Cyberse/LIGHT/Level 2/ATK 0/DEF 0). You can only use this effect of “Cyberse Gadget” once per turn. Cyberse Gadget is our last card for August, and I have to say, I’m a little disappointed by it. With “Gadget” in its name, I was hoping for something revolving around the Red, Green, and Yellow guys from back in the day, but alas that isn’t the case. 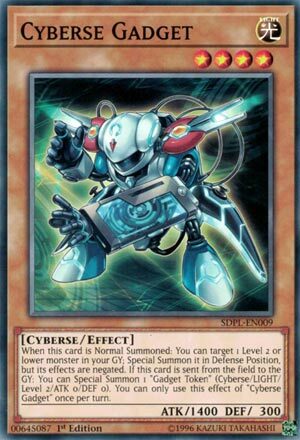 This Cyberse does have a Normal Summon effect like other Gadgets, but its more Junk Synchron than a Gadget. You do get a token once Cyberse Gadget hits the grave from the field, which gives you a great option for another Link Summon. There are plenty of Level 2 monsters that can combo with this card as we learned with Junk Synchron. Come to think of it, this card pretty much is another Junk Synchron. Now decks that revolve around that card can run a playest of this monster and it will be like having six of their main monster. If that could happen to any meta decks it would be hitting the ban list the next format. Cyberse Gadget is a Level 4 Light Cyberse-type monster with 1400 Atk and 300 Def. None of those stats matter except for Cyberse, but that’s a given at this point in Link Spam decks at this point. Honestly, I appreciate the 1400 Atk. It at least gets close to being respectable. Cyberse Gadget has 2 effects. The first can trigger off a Normal Summon to Special Summon a neutered Level 2 or lower monster from the grave in Def position. Cyberse run all kinds of levels, but the lack of restrictions makes Cyberse Gadget useful outside of Cyberse decks similar to some of the original Tuners. Additionally, if it goes from the field to the grave you can Special Summon a very weak Gadget Token once per turn. Obviously Link climbing is cool, but this could technically Synchro climb as well. Or just be a defensive option. Good effects on a small body make for an interesting end of week choice. Cyberse fans might run 2 of this Gadget. Happy Friday! We end this week off with an OCG JUMP Promo that got reprinted in their version of the deck and got its first print in the TCG version of the Structure Deck, Cyberse Gadget. Cyberse Gadget is a Level 4 LIGHT Cyberse with 1400 ATK and 300 DEF. Many Level 4s have better stats, but that is whatever at this point. LIGHT is a great attribute and you know about Cyberse at this point. When Cyberse Gadget is Normal Summoned, you can target 1 Level 2 or lower monster in the GY and Special Summon it in Defense Position with its effects negated. There are nice options in the Cyberse Deck to revive with this, including Stack Reviver which would trigger in the GY so the effect negation on field shouldn’t matter. This is also an immediate Link 2 with the right GY set up and when used as Link Material, can help extend your Link plays as when this is sent from the field to the GY, you can Special Summon 1 Gadget Token (Cyberse/LIGHT/Level 2/ATK 0/DEF 0) and this is a hard once per turn effect so you don’t have too much Token spam, but at least the Normal Summon effect isn’t a hard once per turn in case you can Normal Summon another one in a turn. Hey, the token basically guarantees you can go into one Link higher than you already could thanks to Link Spider, turning a Link-2 into a Link-3 and a Link-3 into a Link-4. Cyberse Gadget is a great Normal Summon in the Cyberse deck, worth playing three of as you do play several Level 2 or lower monsters in the deck. Art: 4/5 Kinda wish it looked like the other Gadgets, but beggars can’t be choosers. Cyberese Gadget closes the week, who you’ll see, has rather paltry stats for a Level 4 Monster. 1400 attack and 300 defense, straight up, aren’t good. We like Light attribute though, so that can be a point for our little friend. So, a Normal Summon of this card gets you a Special Summon of a Level 2 or lower Monster from your Graveyard (in defense position) with negated effect(s). We like +1, and that should help you Link Summon, but give you an advantage at least in terms of presence. When this card is sent to the Graveyard (and we have a beautiful instance of not having a specification as to who has to send it there, so long as it goes from the Field, no stipulation as to how either) you get a Gadget Token (Level 2, 0 attack and defense, Light, Cyberese) so awesome. Gaining advantage when you Summon this card, and when you lose it, make this a very handy and welcome addition to the Cyberese family. I’d definitely be using two, and honestly maybe even three, it’s a great little go engine in the Deck.